This post was supposed to be up a couple of weeks ago but I somehow thought I had accidentally deleted all my pictures! ANYWAY, if you follow me on Instagram or Facebook, you will know that I recently Instagrammed a picture of beads, mentioning that I was finally making time to make jewelry again. Nobody has really seen the end product yet, except for some buddies. So this will be the big reveal (right..). Before I show you the final outcome, for those of you who are curious, I am going to share with you really simple techniques to make your own jewelry! 1. Cut out approximately 7 inches of nylon string. 2. Put the jump ring and the french crimp through the nylon string. (Continue doing the same, with or without the crimps). 3. Fold the nylon string (don't flatten it), and push the end of the string through the french crimp and pull it through. 4. 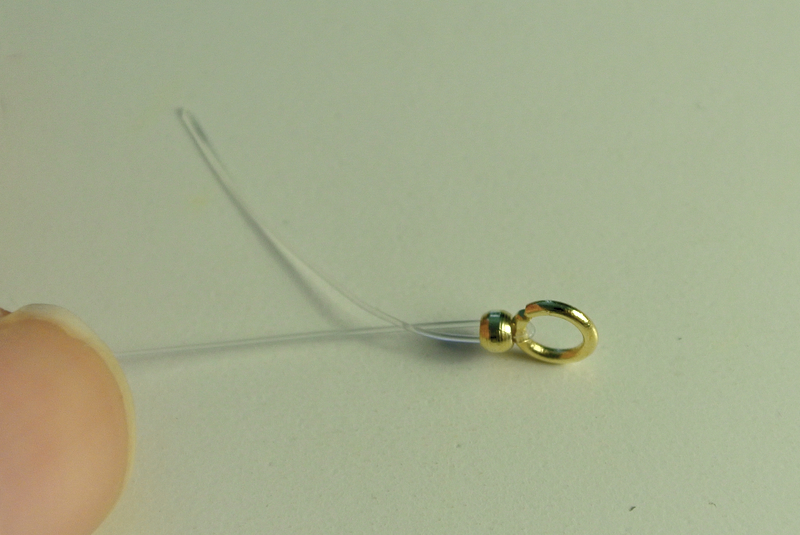 Push the crimp through to the end (pictured above) and fasten it tight against the jump ring. You can use more than one crimp if you'd like for it to be stronger. 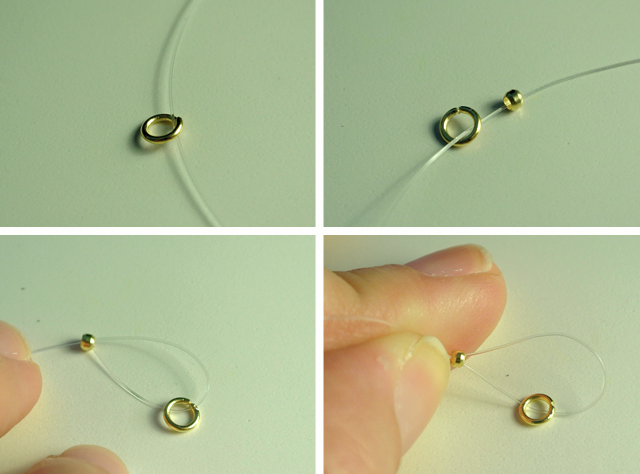 Use the a bead to do the same and skip step 5. 5. 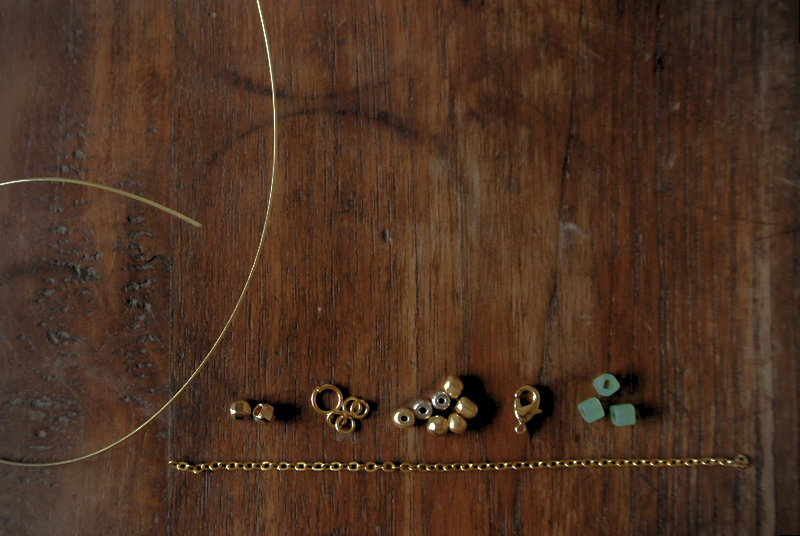 I then threaded the gold bead through the nylon string. 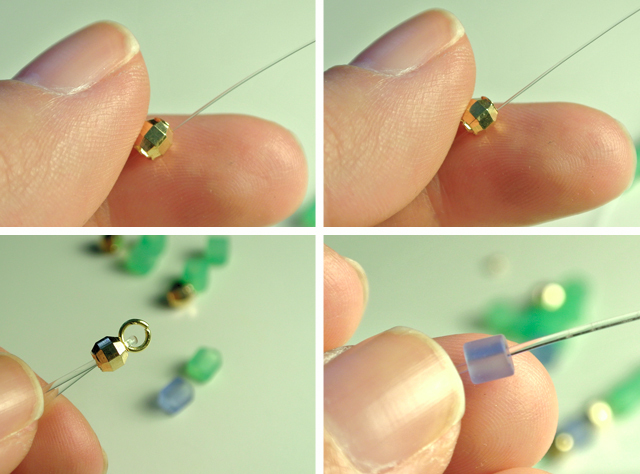 Because it is bigger in diameter than the french crimp, it is the perfect way to conceal the crimps. 6. 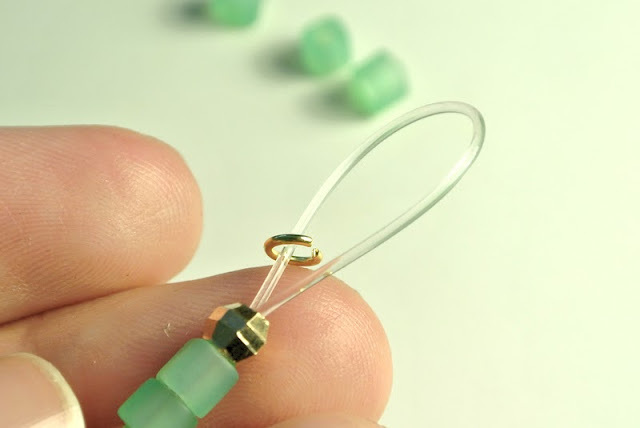 You can start threading your beads through the nylon string from here on. 7. 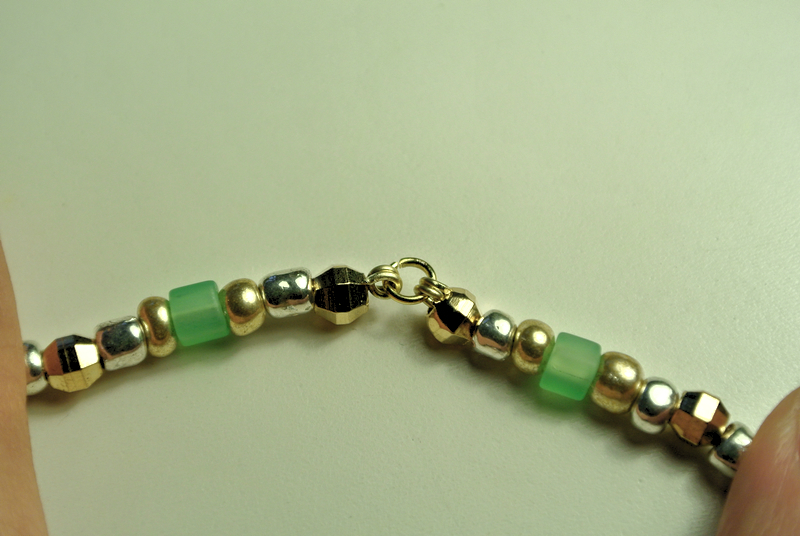 I made mine quite simple, alternating between gold, blue and green. 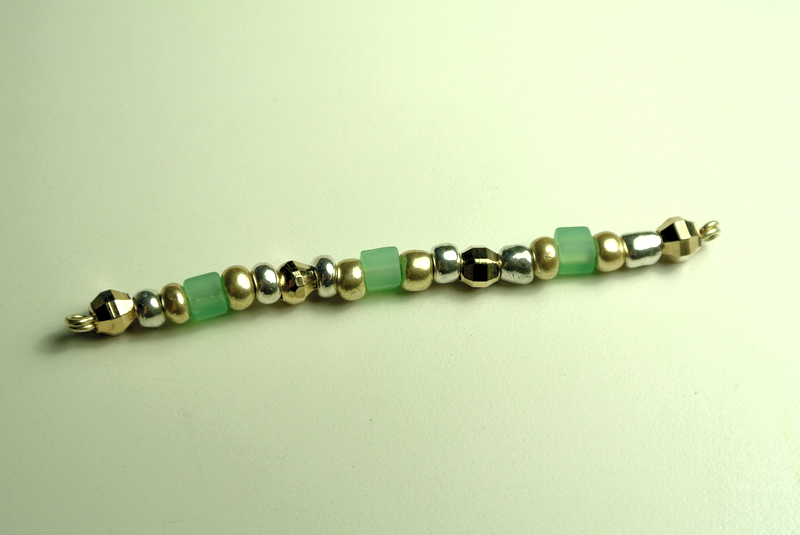 I made this roughly 2 and a half inches long. Don't worry if it's crooked, but try and make sure the beads are tight. 8. To end it, put crimps and bead, and add another jump ring through the end of the nylon strong. And just like before, bend the nylon string through the gold bead. Pull and fasten. Cut off the excess of nylon strong, but be careful not to make this excess too short or it'll come loose. I tuck my excess string, nice and snug under the beads. 9. You will be left with a long worm of beads (picture above). 10. Using the pliers, cut out two strands of gold chain, each 7 inches long. 11. 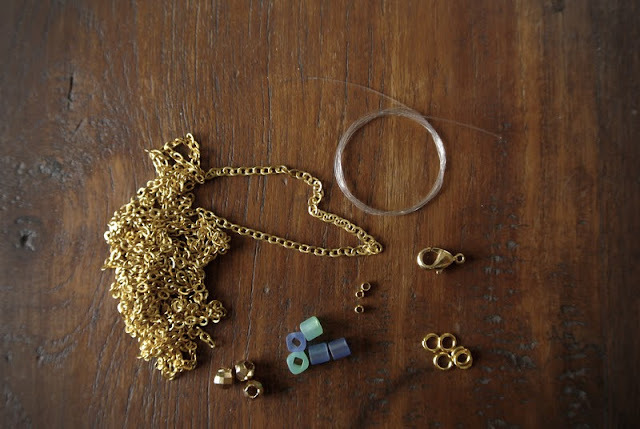 Open up the jump rings attached to the 'worm', and put the gold chain through. Then close the jump ring. Do the same on the other side using the other strand of gold chain. 12. On one end of the chain, attach another jump ring. 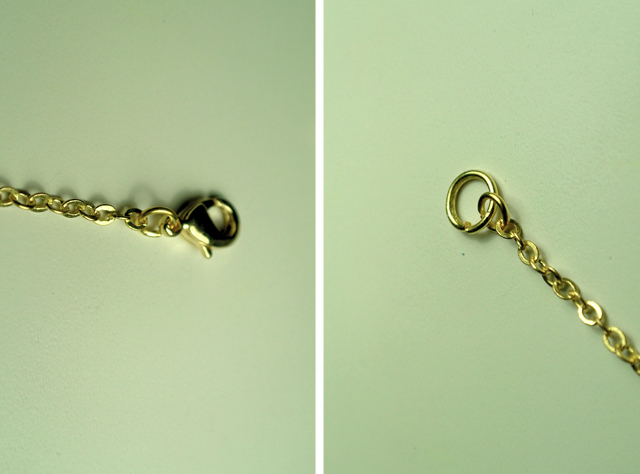 To this jump ring, attach a lobster clasp (left). 13. On the other end of the chain, again, attach a jump ring. You may end here but I decided to attach a bigger jump ring to the smaller jump ring to make things easier when I put on the necklace. 1. Using the cutting pliers, cut out approximately 7 inches of shaping wire. 2. 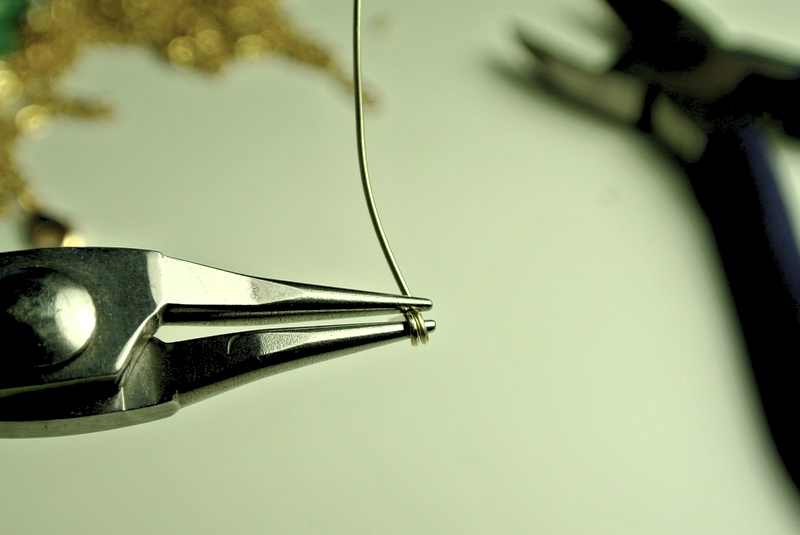 With the shaping pliers (mine is a pair of chain nose pliers), hold on to one end of the shaping wire. 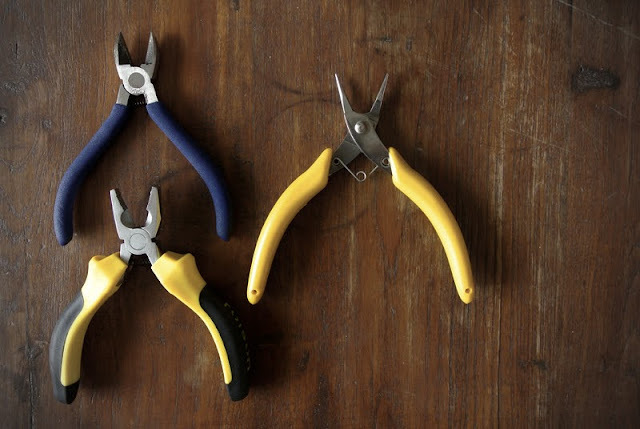 Then, very carefully coil the wire around the pliers (pictured above) to create what looks like double jump rings. 3. You will now have a short end and a long end, with the middle of the shaping wire being a circle. 4. Cut off excess wire on the short end, making the circle as clean as possible. 5. On the long end, thread your beads. 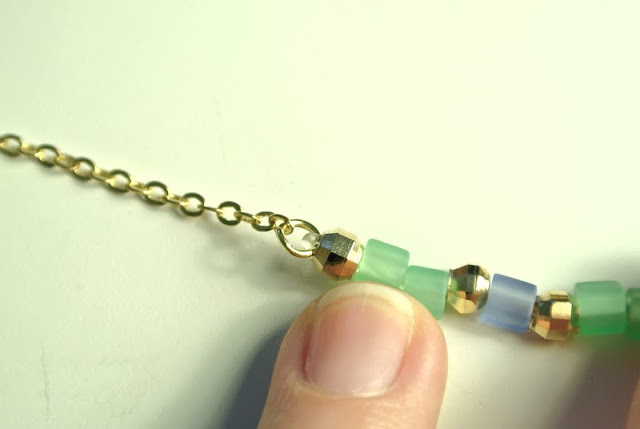 Once you have approximately 2 inches worth of beads, use your pliers and do the same (step 2) to create another loop at the end. 6. The end result will look something like this. 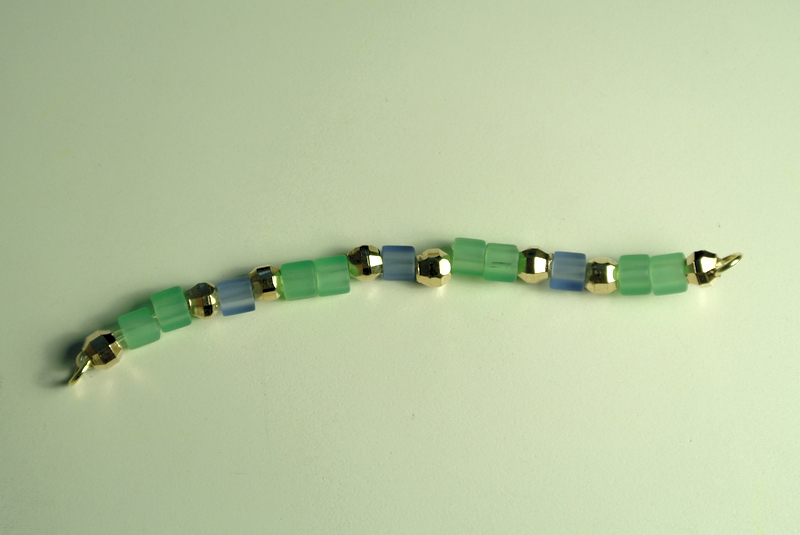 Now repeat steps 2 to 5, to create another strand of beads like in the picture above. 7. Once that is done, use a jump ring to connect both strands of beads together. 8. On the ends of the now one strand, attach one jump ring on each side. 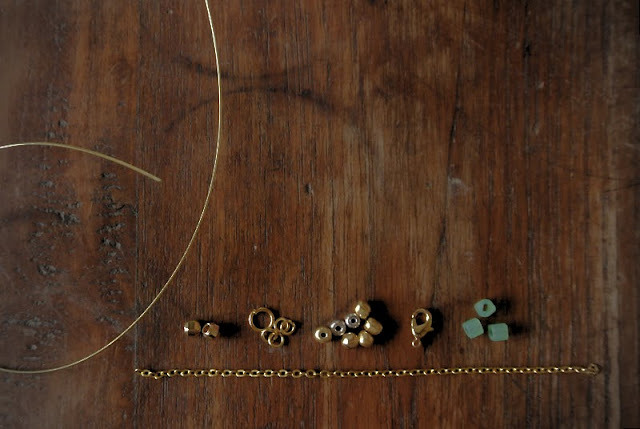 These jump rings will then be attached to two different strands of gold chain, just like in Necklace 1 (steps 10 to 13). 9. Once the final jump ring and lobster clasp is on, your necklace is done! 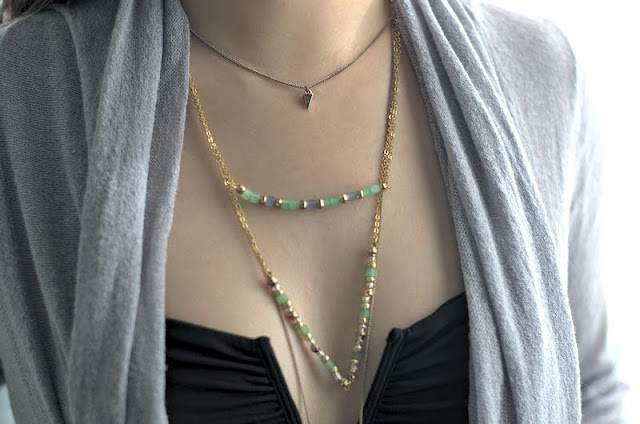 Easy peasy and now you have some simple necklaces that'll be great for layering! Bikini top from Blue Glue (absolutely love their bikinis! ), Kimono cover up unknown. Head on over to Vanessa Mooney, one of my favourite brands from LA, for inspiration. I hope you enjoyed the post! Let me know if there are other tutorials you'd like for me to do. You can easily create these necklaces at home & wear them daily i guess!! Looking for "gold chains designs"? Then we are the best for you, who suit your expectations and budget. We have huge collection for jewellery item. P.S. Now I don't have to use as much glue to make sure they are secure! !